Sickly until his late teen-age years, Penobscot Indian Andrew Sockalexis (1892-1919) overcame his health issues to embark on the greatest running career in Maine history – until 1984 Olympic gold medal winner Joan Benoit Samuelson came along. 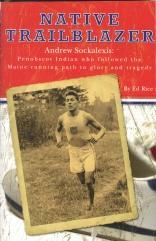 Journalist, author and college instructor Ed Rice chronicles Andrew’s story in NATIVE TRAILBLAZER, tracing Andrew’s meteoric rise to fame at the 1911 Boston Marathon, where he finished 17th in his first-ever race, to the following: his consecutive 2nd place finishes at the 1912 and 1913 Boston Marathon races; his heroic 4th place finish in the brutal heat of the marathon at Olympic Games of 1912; his brief career as a professional runner, matching steps with legendary Indian runner Tom Longboat; and his fatal battle with tuberculosis. Rice is also the author of a biography about Andrew’s second cousin, Louis Sockalexis, the first Native American to play professional baseball and the man who inspired the nickname “Indians” for the Cleveland club. Born in Brookline, Mass., Ed Rice grew up in Bangor, Maine. He has a B.A. from Northeastern University and M.Ed. from the University of Southern Maine. Formerly a journalist, Rice served as the editor of the Weekly Journal in Brewer, Maine and the Winchester Town Crier in Winchester, Mass. Rice is presently a community college English and communications instructor in the central Maine area. Rice has completed 27 marathons (with 8 Boston Marathons) and created Bangor’s Terry Fox 5-K Run, a cancer-research fund-raiser. Rice published his first book, Baseball’s First Indian, Louis Sockalexis: Penobscot Legend, Cleveland Indian, in 2003, with Tide-mark Press of Windsor, Connecticut. In December of 2005, The Angel Fund published a book edited by Rice entitled If They Could Only Hear Me, a collection of 30 personal essays (including one by Rice) that describe personal involvement with the fight against Lou Gehrig’s disease. An Orono, Maine resident, Rice has a web site at www.sockalexis.info. mail order,World Wide Travel, Photography, Canadiana, Ephemera, An interesting collection of varia. Over 49 years of bookselling experience. Items offered, subject to prior sale.Prices are in US dollars. VISA,PayPal,HST will be added to Canadian orders.Institutions billed.